The image above is a visualization of entrainment processes at a convection boundary in a stellar hydrodynamics simulations. 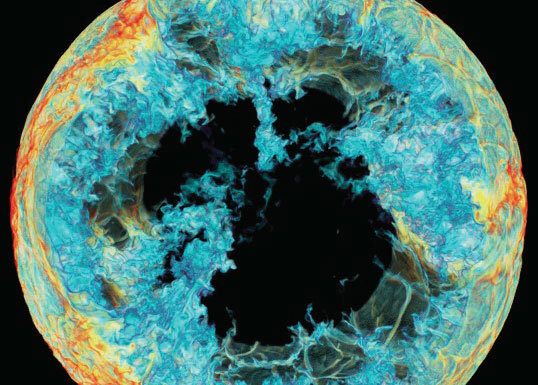 Shown is the concentration of H-rich material that is mixed from a stable layer (outside the spherical circumference, not seen) into an underlying Carbon-12 rich convection layer inside a star. This run was performed on a 768^3 grid over 1.47 million time steps on the WestGrid cluster Orcinus (April 2012), running on 2056 cores for a total of 500,000 CPU hours (56 core years). This image was provided by Herwig (UVic) / Woodward (LCSE). A University of Victoria research program investigating the nature of mixing processes of stars could play a critical role in supporting present and future observational missions. Led by Professor Falk Herwig, and in collaboration with Paul Woodward at the University of Minnesota, the studies focus on the mixing processes in very metal-poor stars that formed in the first and second burst of star formation in the very early universe. "At that time, the overall metal content of the universe was extremely low, and stars forming out of such primordial material are known to host special types of hydrodynamic mixing processes that can be investigated through three- dimensional hydrodynamic simulations," says Herwig. "We are using WestGrid and Compute Canada - Calcul Canada resources to specifically investigate the ingestion of H-rich material into He-shell flash convection regions in evolved primordial stars." This builds on earlier work of Herwig’s, which used WestGrid’s Orcinus cluster to investigate white dwarf He-shell flash stars and demonstrate excellent agreement between the simulation and observation-based predictions of the hydrodynamic mixing. The data-rich 3D simulations performed for this research are massively parallel, with typical HPC runs using between 2,000 and 4,000 compute cores for more than a week. "Without the resources from WestGrid and Compute Canada - Calcul Canada, this type of research, which is internationally acknowledged to be of critical and increasing importance, would not happen in Canada," said Herwig. "Our research demonstrates generating scientific knowledge through predictive science simulations, and supports the activities of critical observational missions, such as those at the Herzberg Institute of Astrophysics."